The last major Audi A4 model change occurred in 2017, so it’s not that long between drinks and we now look forward to Audi’s 2019 A4 innings. With their strong and fuel-efficient engines, ideal ride-and-handling balance, and modern interiors they become a mid-size car that’s hard to pass by. Today, a new Audi A4 offers a blend of sport and luxury that few sedans can match, making them a rewarding car to own and drive. 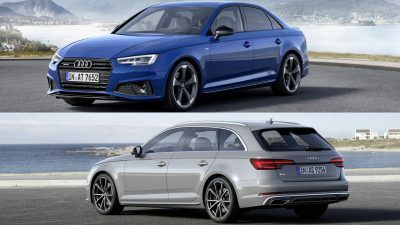 You can have you 2019 Audi A4 in sedan and wagon form, and I highly recommend the station wagon for those who have dogs, or for those who need that extra load carrying capacity on more than just the odd occasion. The big changes for the 2019 Audi A4 concentrate on its styling. Entry-level models get a new front bumper with more aggressive air inlets and aluminium highlighting. The back end shows off slimmer exhaust outlets and a narrower diffuser panel. The overall look is meatier. S line Audi A4 models check in with an appearance more adhered to the RS speedsters, so they boast a sportier front bumper employing wider inlets that direct airflow to the wheel housing. The silver highlights in the grille and low guard section look striking to the eye. A new four-ringed Audi logo is situated on the S line’s lower rear doors, and you also find a set of red brake callipers, 19-inch wheels, a sports suspension and LED headlights as standard on the S-line models. The A4 Avant (wagon) boasts an RS spoiler at the rear. Slip inside the new A4 and a sportier flavour meets the eye. You now have carbon-fibre inlays in the dashboard, a chunkier steering wheel and deep, bolstered sports seats. These additions making the right appeal for your senses, and the bolstered seats are very comfortable giving longer lasting comfort levels over the long haul. The Black Optic Plus package is newly available on AWD premium models. This feature blacks out much of the A4’s exterior trim including the grille, window surrounds, wheels, rear spoiler, and mirror housings and adds a sport steering wheel, glossy black trim, and subtle red upholstery stitching inside. Premium models gains heated front seats and a complement of S line exterior enhancements. Midrange A4 models benefit from standard blind-spot monitoring with rear cross-traffic alert. Prestige models comes with more advanced driver-assistance gear, including adaptive cruise control, automatic high-beam headlamps, and traffic-sign recognition. Featuring in the 2019 Audi A4 is a new infotainment system consisting of a 7.0-inch centre touchscreen that’s controlled by a rotary knob on the centre console should you prefer. An 8.3-inch touchscreen is optional on base models. Audi’s excellent Virtual Cockpit that includes a 12.3-inch gauge cluster display looks amazing, while features like Apple CarPlay and Android Auto, Bluetooth, two USB ports, and voice command are all standard A4 offerings. Satellite navigation, SiriusXM satellite radio, and in-car Wi-Fi are included in higher end models or in some of the option packages. Do test the upgrade option for sound: the Bang & Olufsen audio system with its 19 speakers – the sound is glorious! The new Audi A4 is perhaps the best all-rounder car in its class. You do get a compelling case of athletic performance, a comfortable and well-built interior, high-tech features, and a handsome exterior design when you get into the 2019 A4 model. Out accelerating its rivals while sipping on its fuel; and then accommodating its occupants in a quiet, spacious, and well-appointed cabin make the A4 ideal. 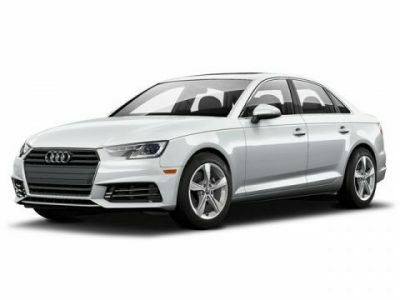 Out on the road, the 2019 Audi A4 has a very nice ride that blends sport and comfort perfectly. Under the hood Audi have the new A4 engine variants down to two options. A quick 2.0-litre petrol turbo with 188 kW is nice and sporty for those who want an A4 with plenty of get-up-and-go (In Quattro guise you can have the 0-100 km/h done and dusted in around six seconds.). If more efficiency is preferred, then a less powerful, more fuel-efficient version called the Ultra makes 142 kW. Transmission options include a six-speed manual or a seven-speed dual-clutch automatic, both of which are very nice and easy to live with. Front-wheel drive is standard, and Audi’s famous Quattro all-wheel-drive system is optional. The new Audi A4 is a quick car but also remarkably efficient in the real world. With speed comes the other ‘S’ word – safety. The A4 has the full five stars from the National Highway Transportation Safety Administration and also has Top Safety Pick from the Insurance Institute for Highway Safety. Unfortunately, many driver-assistance features are limited to costly upper trim levels. So features like the blind-spot monitoring, lane-keeping assist, and adaptive cruise control are features you’ll find in the high-end models only. That said, this is a solid safety pick – base model included. So, you got the low down on the latest A4. It’s quick, efficient and sportier looking. I think you’ll like it. For any more information on the 2019 Audi A4 or, for that matter, any other new car, contact one of our friendly consultants on 1300 303 181. If you’d like some fleet discount pricing (yes even for private buyers! ), we can submit vehicle quote requests out to our national network of Audi dealers and come back with pricing within 24 hours. Private Fleet – car buying made easy!